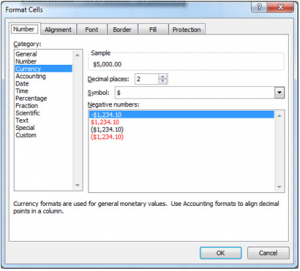 A great feature of Excel is its ability to be customized in color, fonts, and more. Other options like borders and alignment for cells can be edited as well. Start with simply changing colors, which makes color-coding and file organizing easier. In the downloaded example file, select cell “A2”. The Highlighting tool in the ribbon is the image of the bucket pouring a yellow color. Click that and choose a color. Cell A2 will then be highlighted. The button to the right of it marked with an “A” and a red bar will allow you to change text color. Currency is just one of the options that can change numbers to other data like dates and fractions. 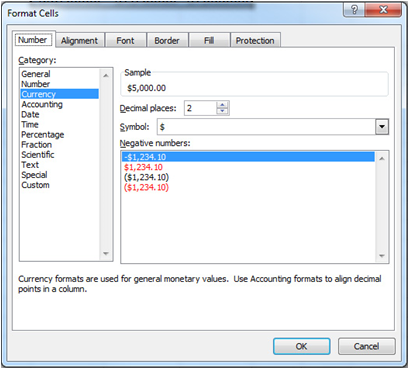 Just enter your number and select “Format Cells” option to change them. When using the fill handle, you can copy formatting and formulas from one cell into other cells. Follow the steps below and complete them in your spreadsheet. Click on cell A4, which has March in it. Put your mouse on the bottom right corner with the square, and a small cross will appear. Click and drag the black cross down in the spreadsheet to the 13th row. The rest of the months of the year will automatically fill in.